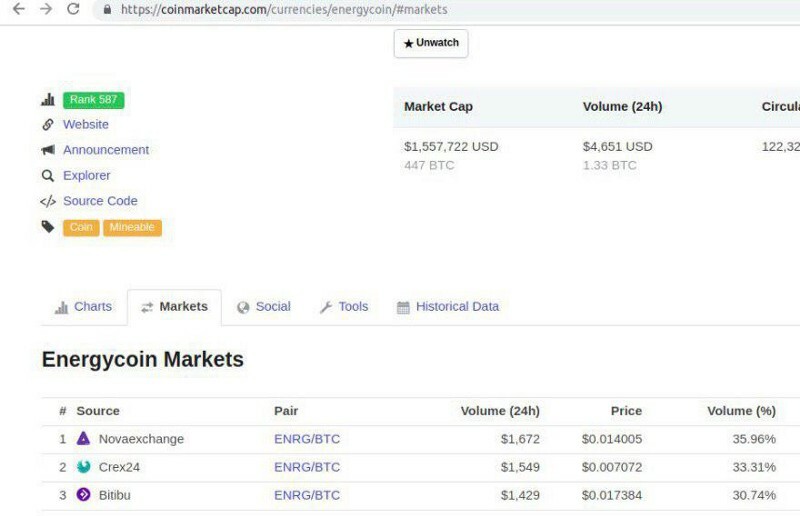 As you may all know, due to a low volume in October, ENRG was delisted from Bittrex exchange, which caused setting it as an inactive coin on CMC. Now that we have secured the liquidity of the coin, and have active ENRG markets, we are back on CMC as an active coin! You can see all the information about EnergyCoin on CoinMarketCap. Keep trading guys! There are three active ENRG marketplaces: Crex24, Nova Exchange and Bitibu. For now, those three are the current active marketplaces containing BTC — ENRG pair. However, BTC — ENRG is not the only market pair on the three mentioned marketplaces; there are additional market pairs on both Nova Exchange and Bitibu: DOGE — ENRG and BTB — ENRG, which widens the scope of trading options with EnergyCoin. Thanks to the progress we’ve made alongside our community of both supporters and traders: we’re finally back on CoinMarketCap! Now, let’s strive to progress even further and move ENRG towards the the very first pages on CMC. We can do it! In case you feel risky about trading ENRG on the current bear market and decide to keep your stash for the better days; do not hesitate to use our web and desktop wallet. Stay tuned for the further updates, peeps! We’re planning to release new details regarding Phase Two of the EnergyCoin Dashboard Application next week.